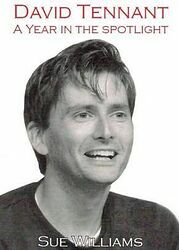 David Tennant: A Year In The Spotlight examines how the media reported David Tennant's career during 2008. 2008 was a momentous year for David Tennant: he filmed the BBC's flagship drama Doctor Who for 4 months, played in Hamlet and Love's Labour's Lost for the Royal Shakespeare Company, announced live on national television that he would be leaving Doctor Who, filmed the Stephen Poliakoff movie Glorious 39, won numerous awards throughout the year, was interviewed extensively on TV, radio & in newspapers and achieved great reviews from theatre critics. He also had to miss the Hamlet London Press Night due to an operation on his back but made a super-fast return to the London stage in time to complete the Hamlet run. There was rarely a day that went by in 2008 without David Tennant being mentioned in at least one newspaper either in respect of the publicity surrounding Doctor Who or regarding his theatre career and David Tennant: A Year In The Spotlight explores this phenomenon, at the amazing popularity of Doctor Who and looks at the responses of his fans online during this unique year. David Tennant: A Year In The Spotlight is 394 pages in length and contains over 350 photos (more than 250 are in colour).